Well now, this is not a game I ever thought I would play. 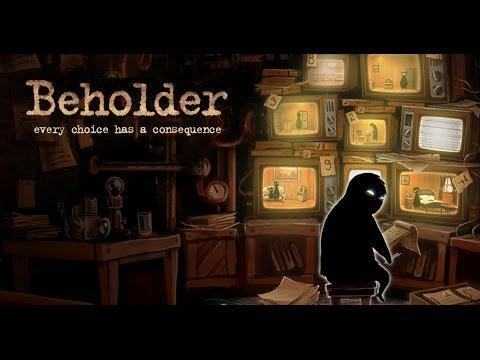 Beholder [Steam, Official Site] has truly captured my interest with the amusing and creepy setting. It's disturbing really, nothing would freak me out more than the thoughts of someone spying on me in my own home. The idea of someone peeping through a keyhole at me gives me the shivers. Will you side with the Ministry, or will you protect your tenants? It's a game about morals and how you want to deal with your duties and your humanity. You may feel some tenants are a genuine risk, and others harmless. It offers a simple side-scrolling approach, much like the interactions seen in This War of Mine, with you clicking on objects and directing your character around the screen. The game is a mostly linear experience, as your encounters are not randomly generated. I've seen people request a more open game with randomly generated quests, but that would take away from the experience of going through the story. Perhaps an additional endless mode where you can keep upgrading the building and doing more and more would be interesting. The developer has stated they are already working on a more casual mode that's easier, so maybe they will be open to more modes in future too. You will bug apartments with cameras, search through their belongings and report back to the Ministry on what you find out. You don't have to be honest with the Ministry, as it's all part of how the story unfolds. Your choices will affect one of a few different endings of the game. The panic I felt searching someone's apartment when I noticed them about to come upstairs was crazy, they found me too as I didn't have enough time to get out and now they don't like me much. One thing I don't like about it, is that your progress is only saved on the completion of a quest. You might need to leave with something half-done, to have to come back and re-do it. I found myself completely drawn in by the charming visuals, Limbo-like character designs and a creepy game in overall. A rather interesting game I think is worth you checking out. I cannot find the thread anymore (deleted? ), but this might have been a case where nagging for a Linux version in game's Steam forum actually worked. Have it on the list, looks good, sounds good! Reminds me of Papers, Please and that was a great game! I got it earlier today, it's not very forgiving, I got a £250 fine on the first mission, then arrested for theft because I didn't have the money to pay the original fine.